Celebrate the season with this Spring Vegetable Soup with Shrimp. 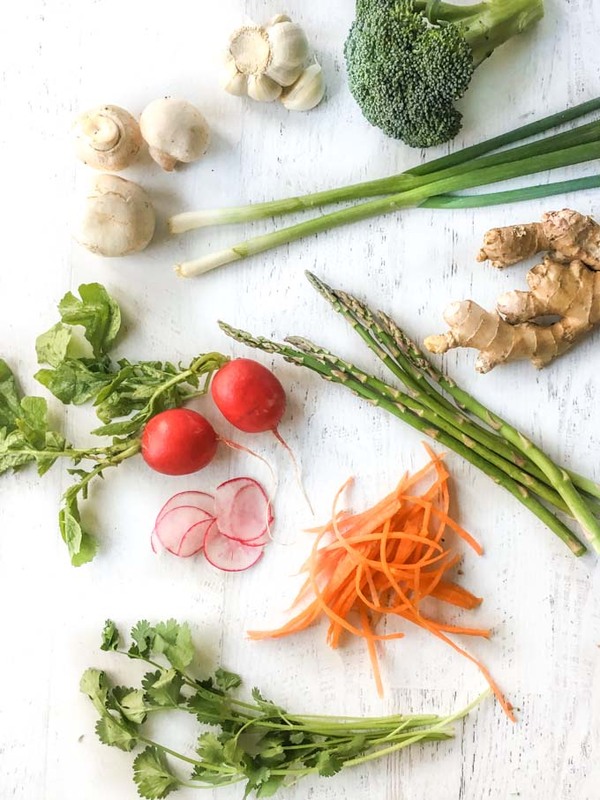 Using lemongrass, ginger and garlic for a savory broth and delicious spring vegetables. Only 3.2g net carbs per serving and takes less than 20 minutes! You might also like this low carb tuna spring roll salad. Spring is here which means that I’m going away from hearty soups and headed toward cool salads. But it’s not very warm outside yet and so I thought I’d make a lighter spring soup with a savory lemongrass and ginger broth. I also wanted to use some of the vegetables that are in season now. And lastly, wouldn’t shrimp go nice with those flavors? Here is my spring vegetable soup with shrimp! I don’t know about you but in spring I’m thinking about my garden and all the delicious vegetables I’ll be growing. I’m excited to use fresh produce and light ingredients in my cooking. Here are some vegetables that are in season in the spring. Some have higher net carb counts than others. Just use them in small quantities. 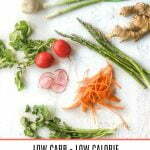 For more spring vegetables click here. I took a picture of the ingredients because are they so colorful. I’m trying to incorporate more colorful vegetables into our meals. As you can see I used asparagus, mushrooms, radishes, carrots, broccoli and green onions. I wanted this to be a kind of throw it all in a pot kind of soup. This is rather a quick and easy soup to make. It will probably take you longer to chop the vegetables than in will to make the soup! Add the broth, lemongrass and garlic to a large pot. 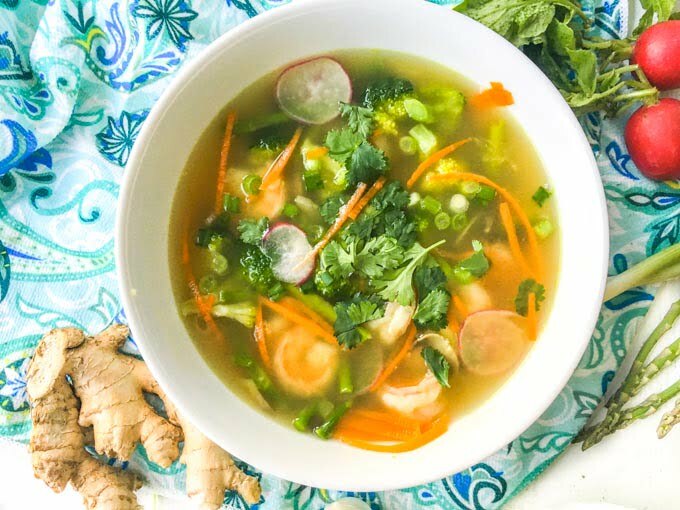 Place the chopped vegetables and raw shrimp into the broth and simmer for about 5 minutes until the shrimp and vegetables are done. Taste and add salt if needed. Garnish with cilantro if you wish. You could use any vegetables you like. I really liked the vegetables I used but you can use whatever you have on hand or enjoy eating. This has a bit of an Asian flavor so maybe think of vegetables you would get in your favorite Thai or Chinese dishes. I hope to cook more with the seasons in upcoming posts and of course Spring and Summer offer a lot of variety for me to pick from. 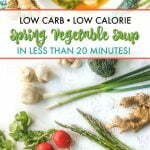 Enjoy this Spring Vegetable Soup in celebration of Spring finally being here! 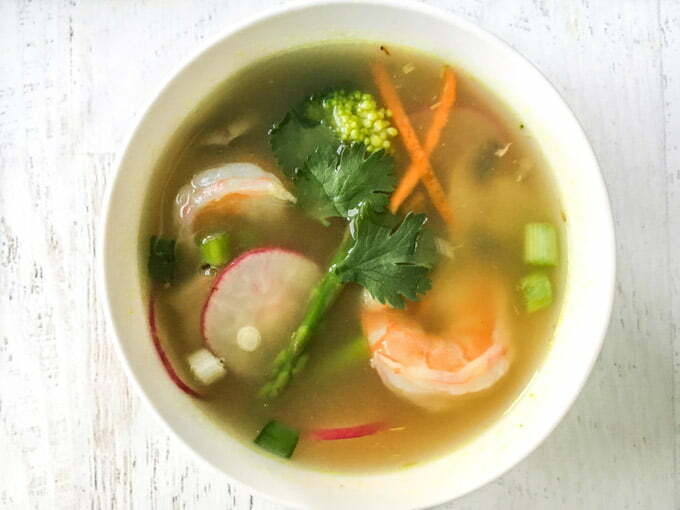 Celebrate the season with this Spring Vegetable Soup with Shrimp. 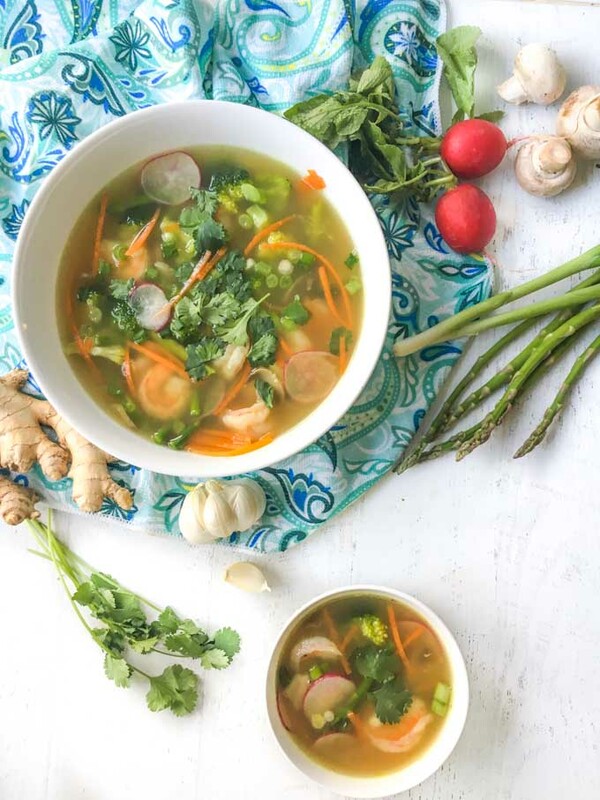 Using lemongrass, ginger and garlic for a savory broth and delicious spring vegetables. Only 3.2g net carbs per serving and takes less than 20 minutes!. Add your broth to a pot along with the lemongrass, garlic and ginger. If you are using the Better than Bouillon add it now. Bring to a boil and then turn the heat down so it simmers for 5 minutes. Add your vegetables and shrimp and cook for 5 or so minutes until your vegetables are soft and the shrimp are pink. Season with salt and pepper if needed and garnish with cilantro. 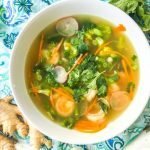 * I love the flavor of Better than Bouillon and now use it in all my soups. You don't need to use it if you don't have or like it. This look so good. I am going to have to try it. Thanks for sharing over at the Snickerdoodle Sunday. Looks delicious, Denise! I definitely want to try this! Pinning and sharing! 🙂 Hope you are having a great weekend!